Tis the season for public relations‘ best and brightest to wield creative wit and savvy strategy in the name of meaningful holiday media placements. There are countless opportunities in print, digital and broadcast available with a little research, packaging and know-how. And, despite the calendar, digital media seem to publish holiday-themed news until the 11th hour, so it’s almost never too late to pitch a good idea. Obviously, the best PR teams began pitching long-lead print outlets back in July, but those publications actually occupy a relatively small and super-select number of opportunities. So, let’s roll up our sleeves and explore all the other options. Make lists (and check them twice). Media love interesting lists. Think gift round-ups with a twist (“Top Gifts for Vegans” or “Must-Have Outfits for That First Tinder Holiday Date”) or “Best and Worst” lists for a particular industry. Try to surround a client submission with other non-competing products or services. Pull the whole idea together as an infographic or slide show to illustrate for media, especially for digital who could end up using piece as is. Prognosticating about the future is a surefire story for many industry pubs at the end of the year. The key is to stand out from the crowd with trend outlooks and forecasts. We recommend taking a contrarian view where possible, but only if it authentically represents a company’s position. Work very hard to make sure the email subject line for this kind of mailing is anything but “me too” so that media will be less inclined to lump it in with more perfunctory prediction pitches. Another reliable story for the holidays is one from a thought leader commenting on leading industry takeaways. It can be a great vehicle for showcasing a CEO or other individual’s smarts as well as a nice excuse to reach out and crowdsource a piece. The different voices will ensure that it’s not perceived as too self-serving and open up relationships that could include your company in someone else’s round-up. Take advantage of a slower holiday news cycle. While a brand may not want to make a major new product announcement between Christmas and New Year’s – a notoriously slower season – it is often an ideal time to serve up a positive feature story. PR people face less competition and the media are often hungry for a feel-good story during holiday time. Here are some excellent examples for inspiration. Package that feel-good story in advance. 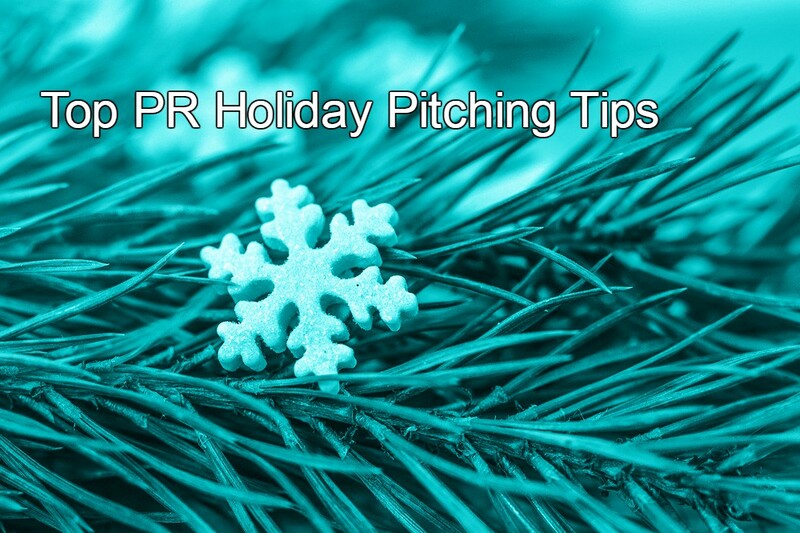 Begin working with PR teams to sniff out some positive, lighthearted news to share during the holidays. CSR-results stories work well here, as do tales of local do-goodery. These include everything from simple toy and meal deliveries in local markets to the grander gesture – something like WestJet’s annual Christmas Miracles campaign. The holidays provide the perfect opportunity to poll the populace on a timely topic. Through the years we have looked at holiday spending, sleeping and travel habits, to name a few. But there are many topics ripe for the picking – for example, for a health-related business, consider querying about worst holiday hospital emergencies. Or, for a wine or spirits company, find a twist on holiday alcohol consumption like this recent survey did. Whether it’s a compendium of tips for dealing with difficult relatives, baking on a budget or traffic tricks to save time and lives, this type of pitch is a winner during the holidays. Once again, strive to provide an original slant, package the information creatively and be sure to offer up an expert for media to interview in conjunction with the advice. Rarely does a year go by without some clever PR person creating a story about how long it would really take Santa to deliver gifts to every child or the true cost of gifts in the “12 Days of Christmas.” (PNC Bank does this every year!) Look for a way a company or product can have an original take on a familiar holiday trope. Perhaps this year, in honor of Hanukkah, a fuel company will tackle how much oil would have been needed to light candles for eight days and generate some fun press. Yes, it’s the sharing season. Whatever tactics your team chooses to implement this holiday season, be sure to amplify them through social media. Take survey results and post to Twitter and LinkedIn. Get some great shots of that “feel-good” story or some colorful tips and post to Instagram. Use video to capture the CEO forecasting the industry future for YouTube. The holiday possibilities are endless.